In the battle to meet the demands of women who want eye makeup that stays put throughout the day, manufacturers have stepped up their game in recent years. The downside is that it can almost feel like you need to use paint remover to get it off. However, the last thing you want to do is use something toxic on such a sensitive area of the skin or risk your vision. After all, even the best eye makeup won’t easily hide a rash or other irritation. Luckily, there are many gentle yet effective products on the market today making it easy to find the best natural eye makeup remover. You may be a bit frustrated at the fact that there are literally dozens of them, but this article should help you choose one because we’ve done the work for you to show you the best natural eye makeup remover options out there. When you choose a product with organic ingredients, you can be assured that you won’t harm your eyes or eyelids. However, it wouldn’t be the best organic eye makeup remover if it didn’t do the job. You can get safe and effective in the same product as these choices clearly accomplish. This product takes advantage of the wonderful properties of grape seed, avocado, macadamia, and jojoba oils in a powerful vegan formula that is gentle, cleansing, and even hydrating to your skin. 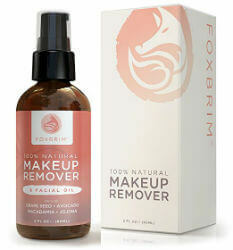 An added bonus is that you can use it to remove makeup, not just from your eyes but your entire face. You can also use it if you do not wear makeup because it is wonderful for dry or aging skin as well. The reviews are through the roof for this product including noting it did not burn the eyes and it removes makeup quickly. Getting four great oils in one product is a great way to remove eye shadow, mascara, and other makeup. The ingredients in this product are a bit different than you might at first expect yet very effective. They actually make a lot of sense when you consider that aloe vera, cucumber, and green tea are all known to have great skin care constituents. This formula not only removes all types of makeup, including eye makeup, but also rehydrates, nourishes, and freshens your skin. If you prefer an oil-free and thus non-greasy formula, this will be ideal for you. Add to it the marvelous fragrance from the orange essential oil and you will love both using this product and the results. It is known that orange essential oil is emotionally uplifting so this makes a great way to release the stress of the day as you prepare for slumber. Made in the USA and 91% organic, you can feel good about using this product. 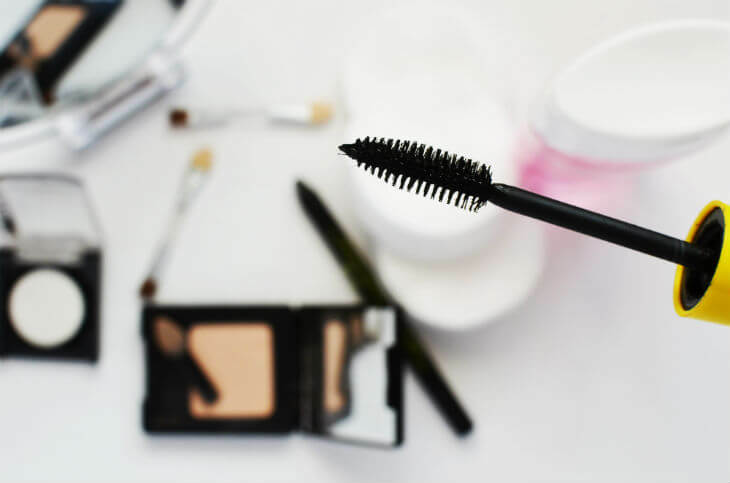 If you are looking for convenience and fragrance-free, in addition to being the best natural eye makeup remover you can find, look no further than this product. 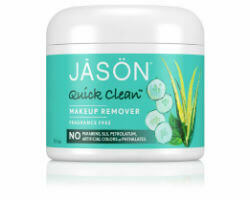 If you're wondering if some guy named Jason came up with this formula and how could a guy possibly understand good quality makeup remover anyway, it may be helpful to know that the name was chosen because JASON means "Healer" in Greek. It was chosen back in 1959 by a group of independent thinkers that wanted safe, gentle, and effective ingredients. For over 50 years they have delivered on that premise and have never tested on animals. The main advantage of this product is that it comes in pre-saturated pads making using them a breeze. That can be a real benefit when coming home late from work or after a night on the town when you might typically just fall into bed without removing your makeup in order to avoid the hassle. Reviews are somewhat mixed so this may not be your go-to remover for all days, but it is nice to have a quick option for when you really need it. It is rare to find a makeup remover that doesn’t just use organic ingredients but has taken the step to be USDA Certified as such. This is a tedious process as you might guess so ensures you of a product made with quality ingredients. This product is also GMO-free, dairy-free, soy free, cruelty-free, vegan, vegetarian, 100% chemical free (no SLS, detergents, parabens or preservatives), and free of alcohol, fragrances, dyes, and other potentially toxic ingredients. It comes in a glass pump bottle that preserves the contents and is convenient to use. Reviewers clearly state that the only thing you are giving up with this product is the dangerous chemicals – it works perfectly as long as you shake it before use. Along with containing no harmful chemicals, you will love that this product contains lavender which is well known for its calming and healing skin loving constituents. The key to the effectiveness of this product is the micellar water which is made up of tiny balls of cleansing oil molecules suspended in soft water. These micelles are attracted to dirt and oil so they are able to draw out impurities in your skin without drying it out. This makes it a great option for acne-prone people. It does not contain alcohol so it is safe to use around your eyes as well as your entire face. 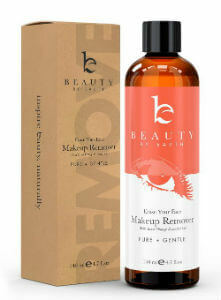 It is great to get a makeup remover and cleanser in one product, thereby streamlining your evening beauty routine. Remember that since it is using natural lavender and not artificial ingredients that mimic the scent it will be different to you, yet far healthier. Even if you are careful to use only makeup with natural ingredients it is still wise to use a natural makeup remover to take it off at the end of the day. In fact, the more diligent you are when using any personal care product, including shampoo, conditioner, face washes, and so forth, the less likely you will develop some of the health problems attributed to the chemicals commonly used in these products. Choosing the best natural eye makeup remover from this list is one step toward preserving your health while preserving your beauty.